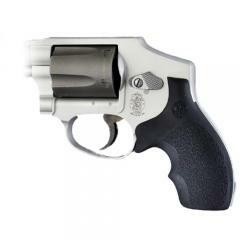 This Bantam-style rubber grip from Hogue replaces the factory original on the small-framed Smith & Wesson J-Frame revolver, one of the world's most popular concealable weapons. It fits into place easily, with no screws required and without requiring you to modify your firearm. The frontal finger grooves and palm swell fit comfortably and naturally into your hand, providing a secure and stable shooting grip. The soft synthetic rubber material makes it comfortable to hold and also helps to cushion recoil, and its textured surface prevents it from slipping out of a wet or gloved hand.